I’m going to refer back to my post from two weeks ago, titled: Heritage Hill, Grand Rapids, Michigan. 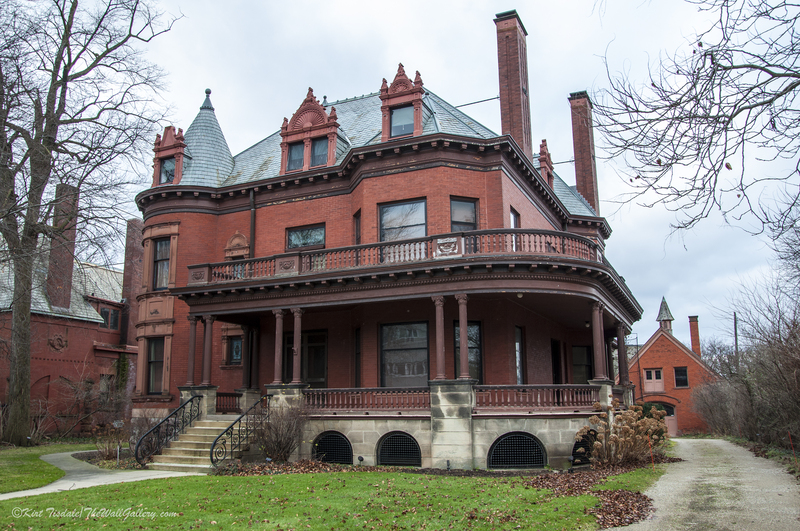 In that post, I mentioned that there was a Frank Lloyd Wright house in the midst of these mega semi-Victorian mansions. Todays post takes a look at this house with seven captures I attached from a 10 minute; stop and shoot what you can, since we’re late for a holiday gathering. Unfortunately, we were unable to accommodate the tour schedule, so I literally was restricted to a quick photo shoot. 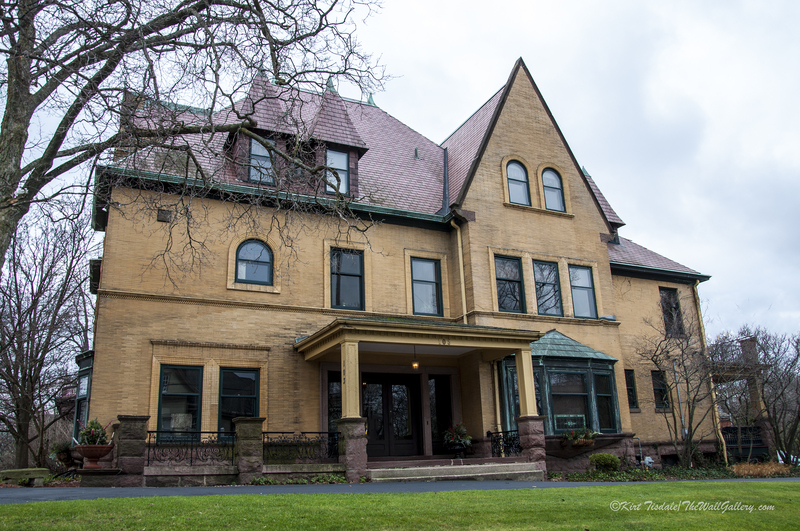 The house in question is called the Meyer May House, located in Heritage Hill, Grand Rapids, Michigan. 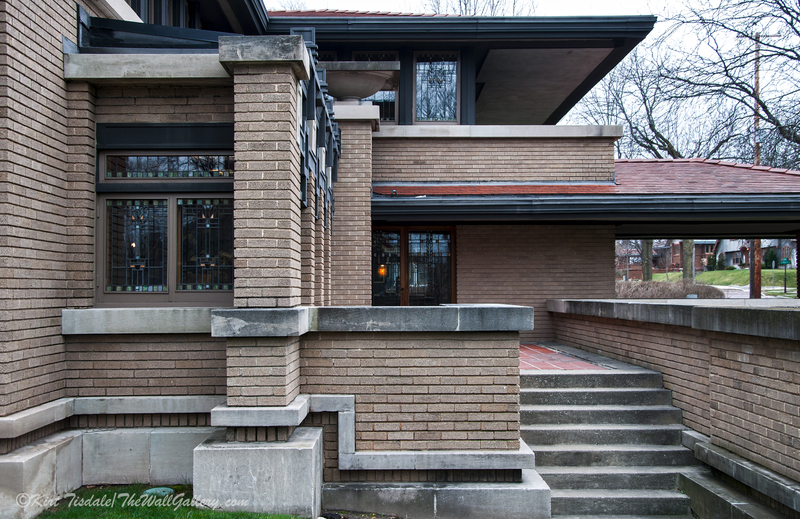 It was designed by Frank Lloyd Wright and certainly typifies his style. 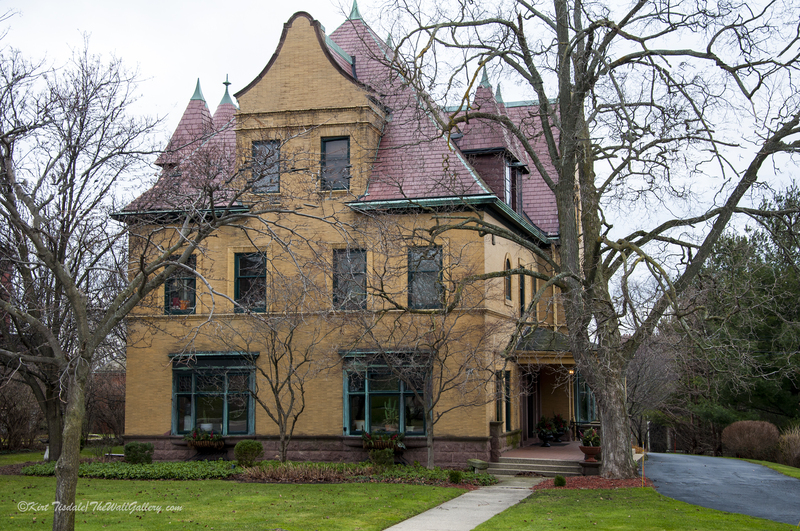 The home itself was completed in 1909 and I can only imagine the talk considering the architecture of the surrounding homes. The house is true to his clean lines and simplicity accented with bold architectural details. 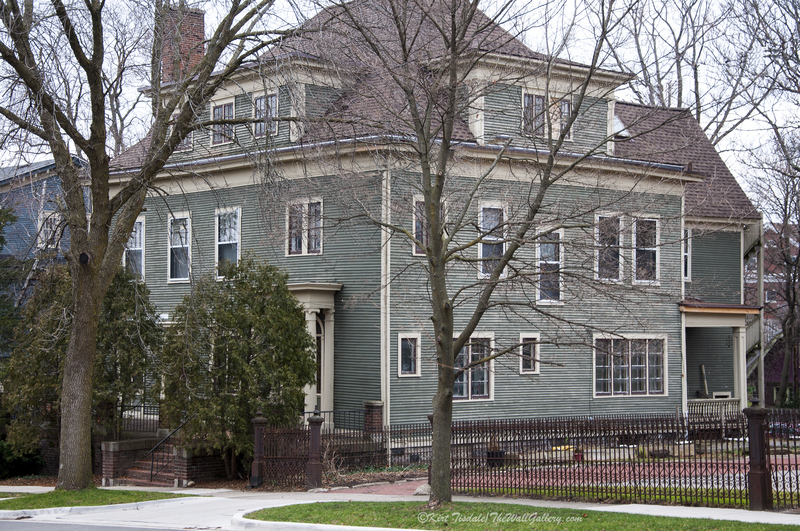 In the 1985 Steelcase (based in Grand Rapids), bought the home as a gift to the community. 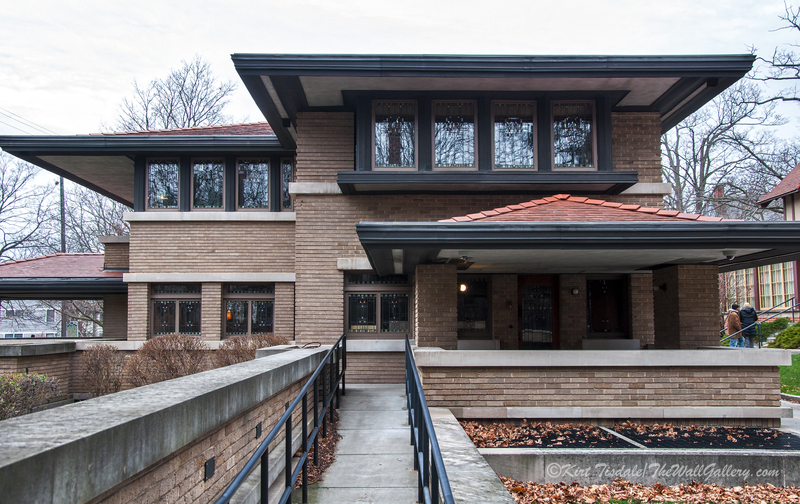 After meticulous and extensive restoration to the original structure, including interior originals and exacting duplicates, the house was open to the public in 1987. 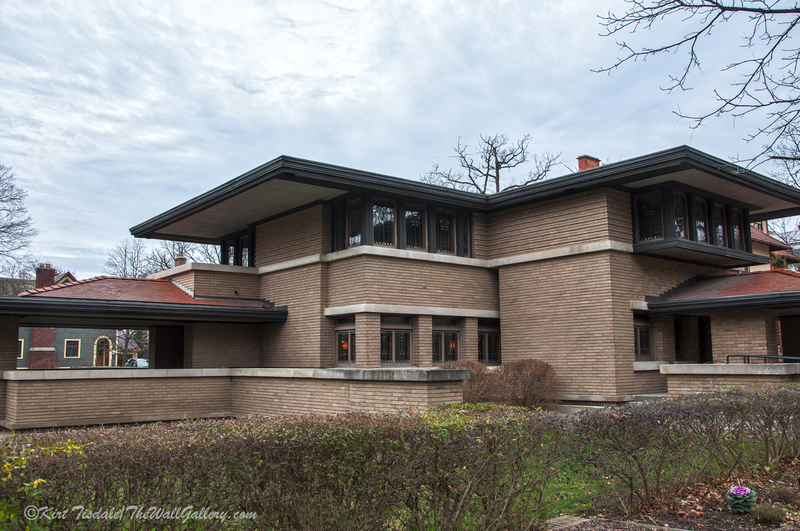 It serves as a rare opportunity to experience an original Prairie house as Frank Lloyd Wright envisioned it. 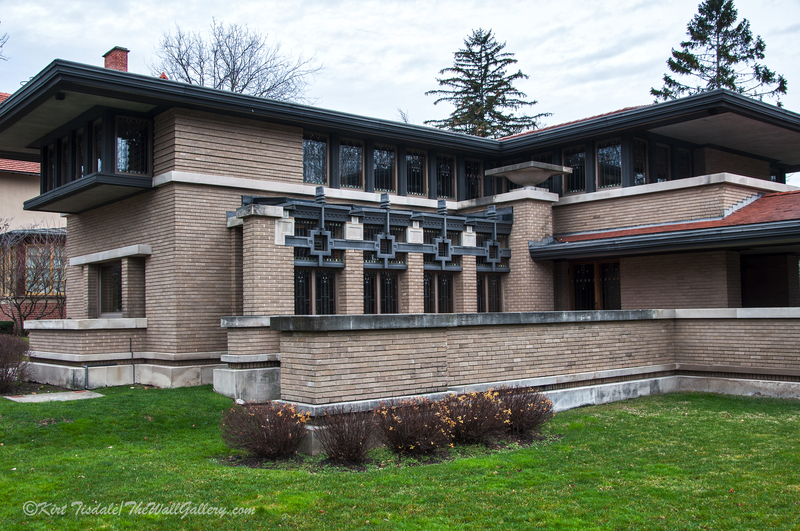 More information here: Meyer May House. The house itself sits on a corner lot. This first capture gives you a perspective for the overall look of the house with the clean lines and simplistic looking design. Please note the two red roofed porticos as a reference point in ensuing pictures. 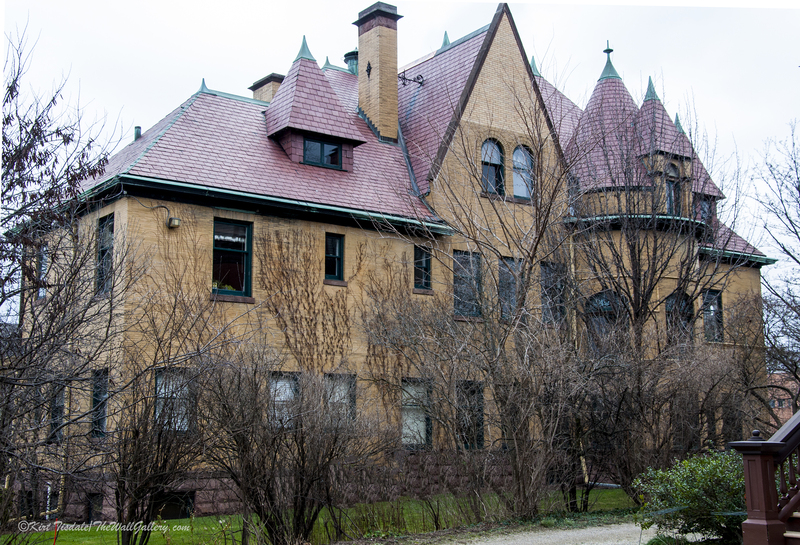 The one in the right of the picture has windows on the second story protruding over it and the one on the left side of the frame has a balcony built into the red roof. 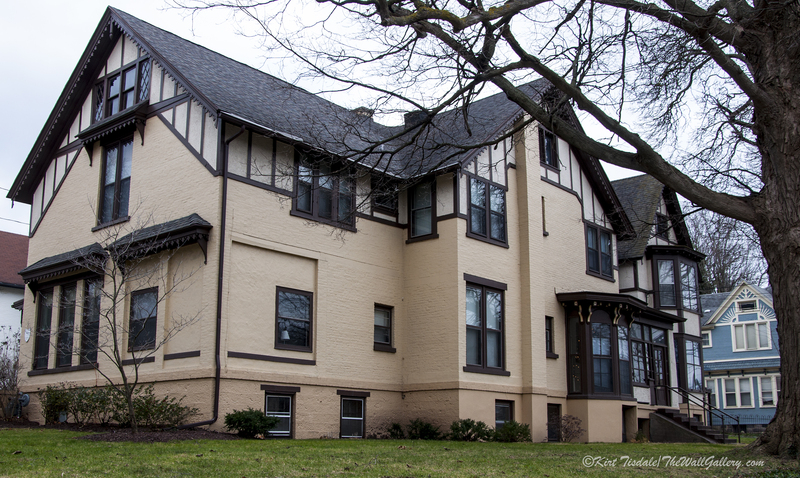 The second capture takes you in front of the red roof with the windows protruding from the second floor. Picture three goes back to the original shot as my next capture takes us to the other side of the house past the red roof with the balcony. Shot number four now has the balcony on the right side of the frame and we are seeing the other side of the house (notice the art deco above the first story windows). Capture number five walks us around the garden wall and lines up with the walkway to the front door. 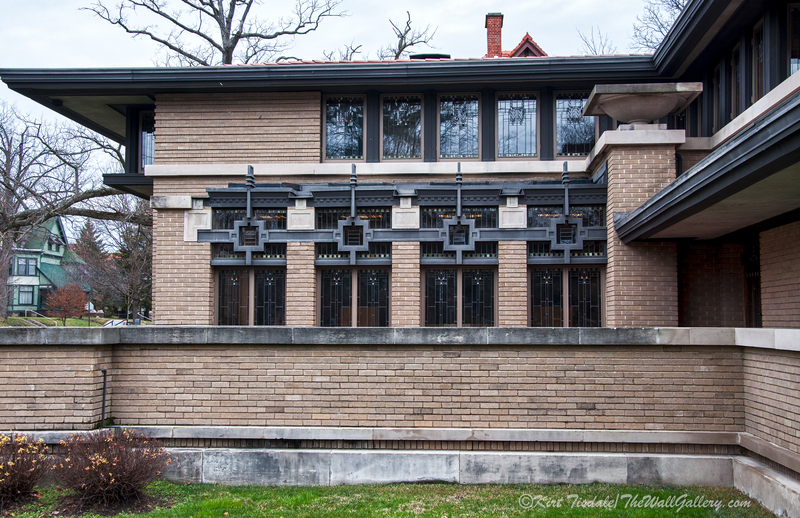 The art deco windows are on the left lining the walkway. Picture number six looks at the windows and again, the walkway in the last picture is just behind the wall out of sight from this angle. the last capture shows the detail of a planter urn in the upper right hand corner of picture number six. For a look inside, please visit the website from my link above…..it truly gives you an appreciation of the beauty of his architecture and the grandeur of the house. 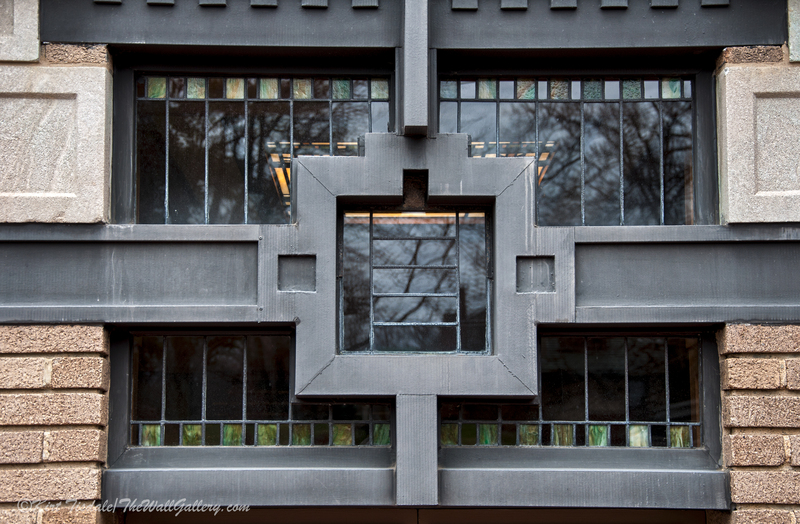 This entry was posted in Art, Color Photography and tagged architecture, frank lloyd wright, grand rapids, interior design, kirt tisdale, michigan, online art gallery, photographer, photography on January 27, 2016 by Kirt D Tisdale. One of the aspects of a good art print or photograph is the ability of the visual display (art print or photograph) to pull your eye into the scene. A quick left to right scan is not pulling your visual interest into the presentation. There needs to be an aspect of the picture that pulls your eye further into the scene. Sometimes, this is an interesting aspect of the subject matter presented and sometimes it’s the simple visual stimuli of depth. Depth in a picture creates an interest for the eye to look further into the composition of the print. One of the easiest ways to do this is to literally create depth in the picture. In real life, we find depth interesting…”oh, look down there” or “I wonder where that goes”… to the most common….”hum…wonder what’s around the bend?”. 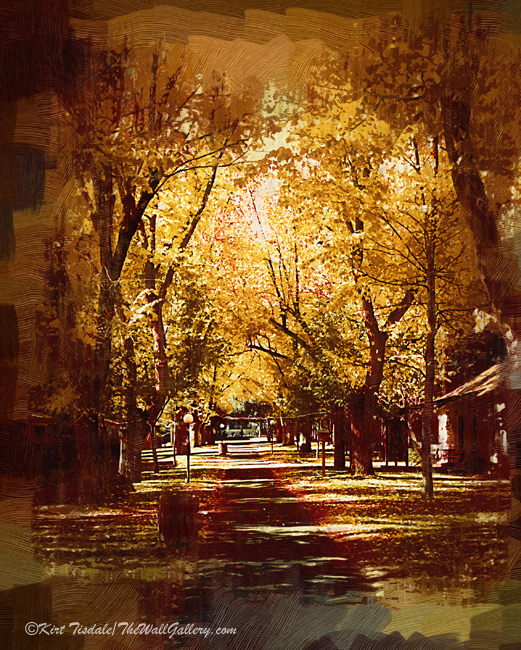 I have attached four art prints from my Street Scenes/People Gallery that typifies my point. The depth elements in these four cases are the scene itself. 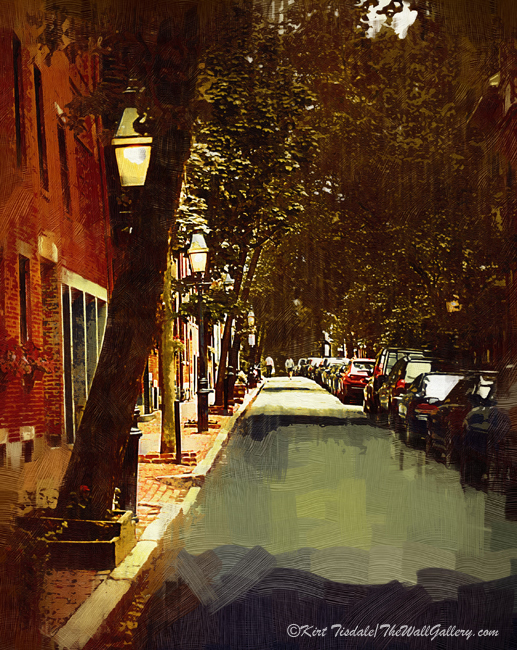 The first art print is one of my more popular ones, depicting a portion of Beacon Hill. Typical street scene and see how your eye follows the road, looking down the street to see what is there. 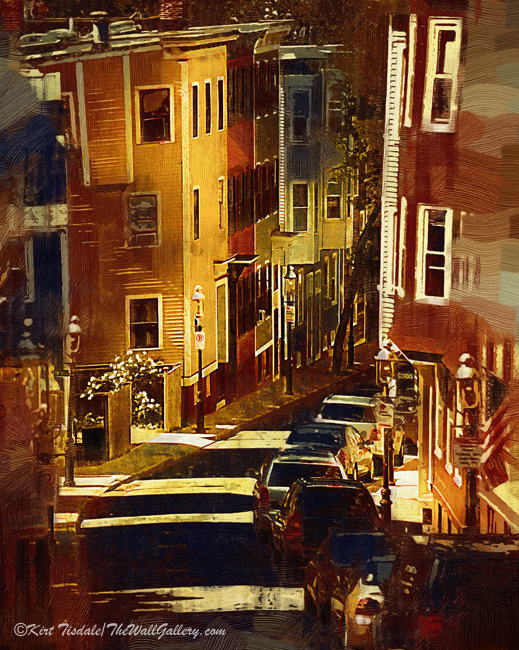 The second print is of Bunker Hill and uses the same element, but plays with the “what’s around the corner” curiosity. Your eye can’t help but follow the road as it winds down the hill. 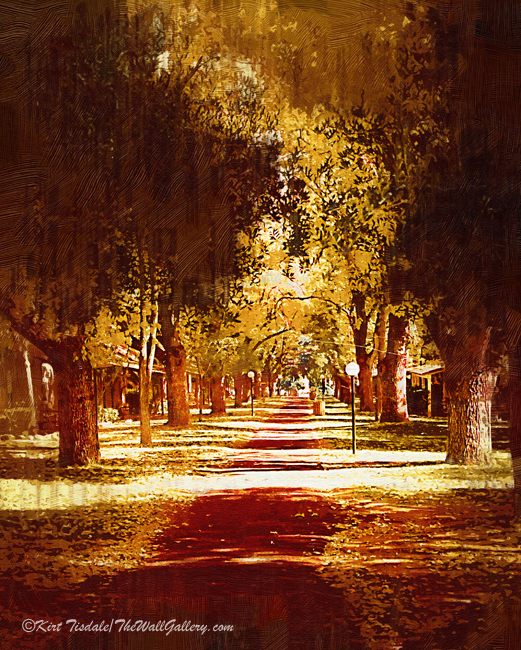 The third and fourth prints from a resort in Warner Springs, California are similar to the first one, in that your eye follows the sidewalk under the arched trees into that remote point way off in the distance. This entry was posted in Art Prints, Landscapes: Oil and tagged art, boston, interior design, kirt tisdale, online art gallery, street scenes, warner springs on January 20, 2016 by Kirt D Tisdale. This first shot is typical of the size of homes in the area. The second capture is another large rambling structure. I love the detail in the trim. This particular house has been split up into multiple rental units as are about 50 % of these large old homes. 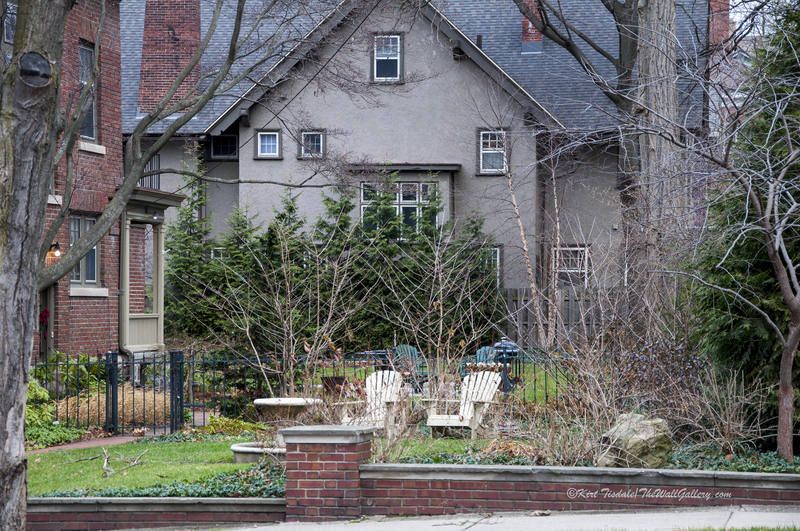 Picture three was a shot that typified the look and feel of the neighborhood. I can only image how beautiful this setting is in the spring, summer and fall. Shot number four reminds me of the large rambling house I grew up in as a small child when we lived in a small farm town in Iowa. Capture number five looks like a small castle. 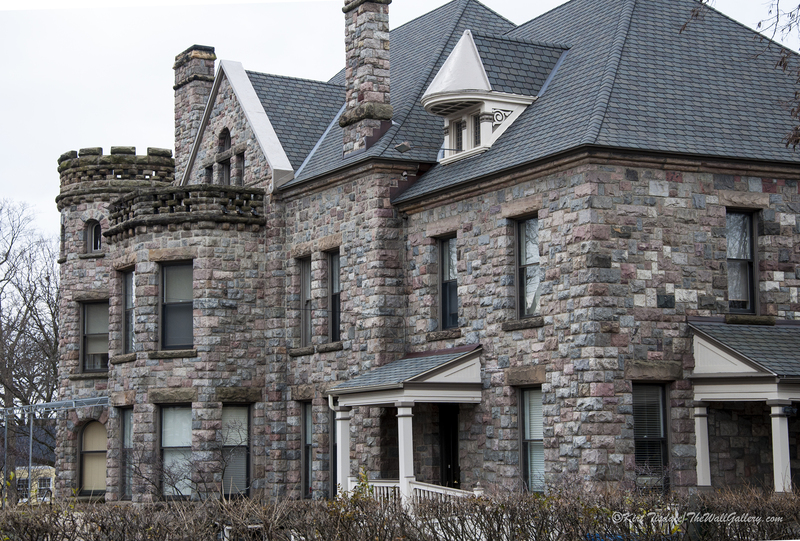 The detail work with the rock (and I am assuming local stone) is incredible. Picture number 6 is the first of three for this house. 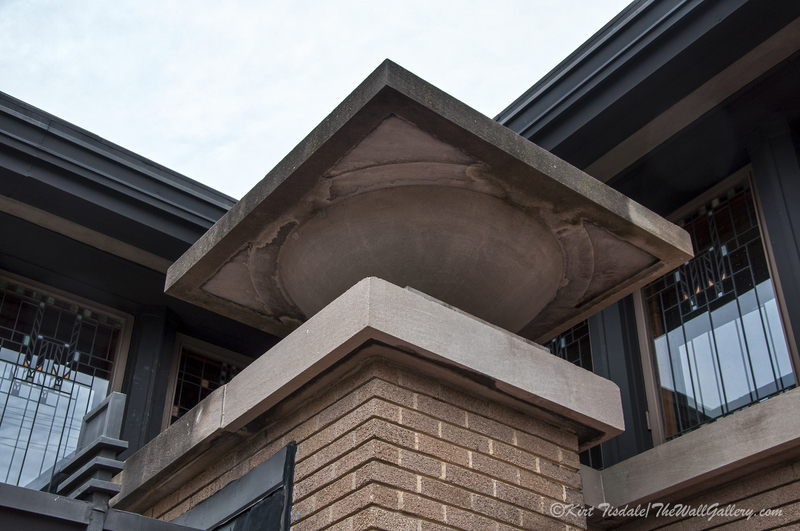 I was able to get to multiple sides of the home for a complete look at the architecture of this structure. This is actually the side of the home, where a carriage would pull up to disembark passengers. Picture number nine and ten are of a house that has been restored and turned into a museum. 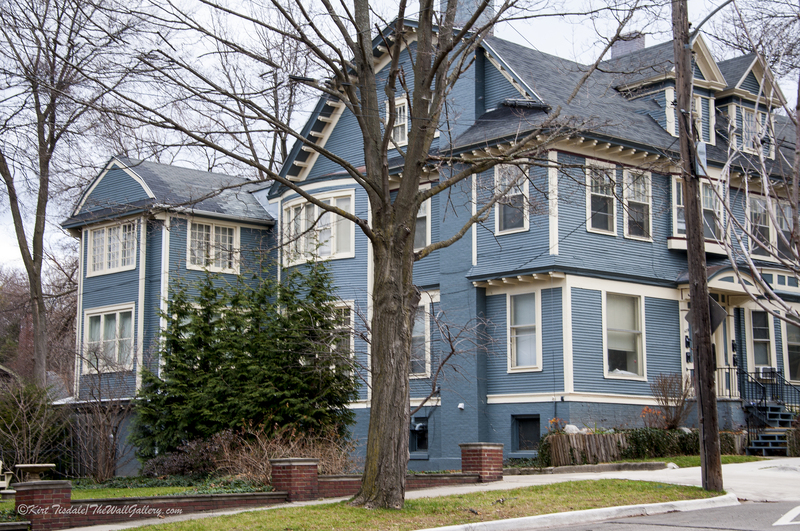 It is located a couple of homes away from the last series. I love the wrap around porch and you can see the old carriage house in the background. This particular street was obviously a very prominent and wealthy street in it’s day. Shot number ten shows the wrap around porch and massive chimneys. So much of this history and architecture has been destroyed in the name of progress across the country and I was happy to see a city embrace the heritage and encourage new growth in this area. Since it is within walking distance to downtown, it is very active with young adults and families allowing close access to work and the many restaurants and shops located there. Thoughts? 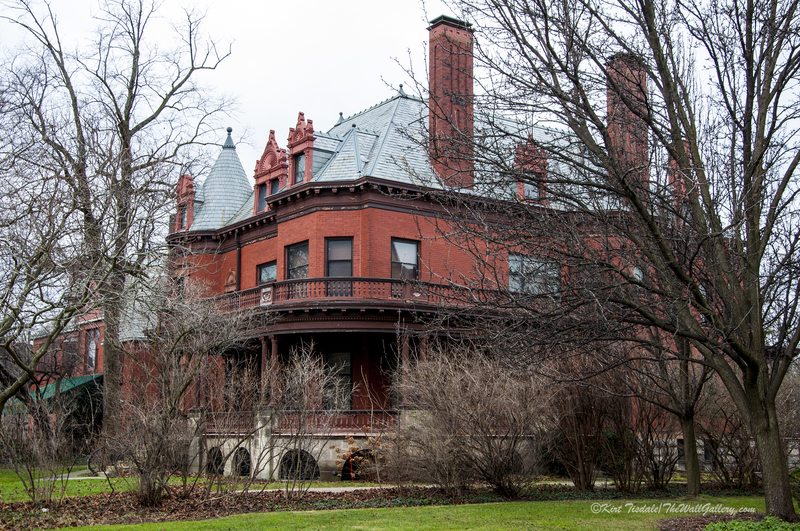 This entry was posted in Color Photography, Photography and tagged architecture, grand rapids, heritage hill, historic homes, interior design, kirt tisdale, michigan, online art gallery, photographer, Victorian on January 12, 2016 by Kirt D Tisdale.